School Choice: Trick or Treat? Boo! Halloween is a scary time of year, so I suppose it’s an appropriate week to talk about “school choice.” Tomorrow evening, A+ Schools is sponsoring a panel discussion with Dr. Howard Fuller, a well-known advocate of charter schools, vouchers, and tax-credit programs. Dr. Fuller will also be the keynote speaker at a full-day seminar sponsored by the Heinz Endowments at the University of Pittsburgh. I’m not sure if anyone will be handing out chocolate, but as we consider whether these programs actually work for students I hope folks will ask: is school choice a trick or a treat? Let’s start with charter schools. As I have argued before, there are a handful of “good” charter schools, but most are not serving Pennsylvania students well at all. [See “12 Problems with Charter Schools”] The state considers a score of 70 or above on its new School Performance Profile (SPP) system to be in the acceptable academic range. (I have also argued that the SPP system is highly flawed, but let’s go with the state’s own data here.) Pennsylvania’s public schools average 77.1, but charter schools lag more than ten points behind, with an average of 66.4. This evidence strongly suggests that charter schools are far more “trick” than “treat” for our students. Yet Dr. Fuller argues that poor students, and especially students of color, need access to more charter schools. Presumably he means the “good” ones. 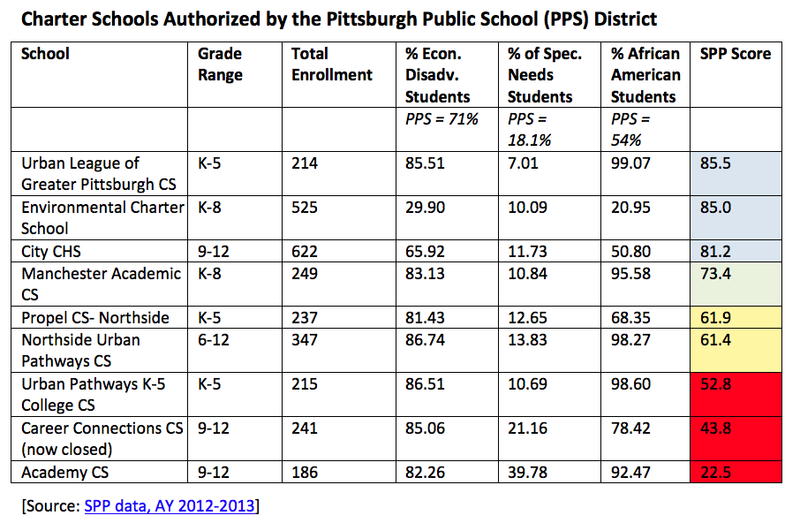 But remember, even the “good” ones in Pittsburgh are not educating the same students as the public school system. Let me be clear: schools like the Environmental Charter School are gorgeous and all of our students deserve the small classes and other opportunities offered there. I want all of our children to have theater training with someone as amazing as my friend Hallie Donner at the Urban League of Greater Pittsburgh Charter School. Will Dr. Fuller talk about how to (finally) feed innovative ideas from charter schools back into traditional public schools so that all students can benefit? Will he talk about how to get rid of the under-performing charter schools that are costing our district a fortune and preventing us from spending desperately needed dollars on student programs? Will he suggest specifically which public schools we should close if we open more charter schools (because that is, in fact, what we will actually have to do)? Perhaps Dr. Fuller will comment on the situation in Hazelwood, where the district created an education desert when it closed all the local public schools. It shifted the neighborhood’s students to Pittsburgh Minadeo in Squirrel Hill and then sold the former Burgwin school to Propel, which opened it as a charter school this year. Now Propel Hazelwood has 123 students paid for by Pittsburgh – almost exactly the number of students (113) that Minadeo lost in enrollment this year, causing it to lose teachers and leading to increased class size. [Post-Gazette, 10-14-14] How does Dr. Fuller want to account for this constant churn and displacement, and the consequences (such as larger class size and fewer resources) for those “left behind” in the public school system? I suspect Dr. Fuller will also talk about vouchers, which Milwaukee has had since 1990. In her book, Lessons from the Heartland: A Turbulent Half-Century of Public Education in an Iconic American City (2013), journalist Barbara Miner explains, “After more than 20 years, one of the clearest lessons from Milwaukee is that vouchers, above all, are a way to funnel public tax dollars out of public schools and into private schools. Vouchers, at their core, are an abandonment of public education.” Wisconsin state test scores show that poor children are not performing any better in voucher schools than in traditional schools (and actually had worse math scores in voucher schools). The people of Pennsylvania have joined citizens in numerous other states rejecting voucher systems. In a nutshell, vouchers are unconstitutional, expensive, not supported by research, and funnel money away from public schools to private institutions that lack accountability, both fiscally and academically. [See “Vouchers, Coming Again Soon”] So would vouchers really be like candy for our children, or a nasty trick? Finally, Dr. Fuller promotes tax credit programs, such as those initiated in recent years in Pennsylvania. These programs are actually tax cuts for corporations that cost us $150 million per year by funneling revenue that should have gone to the state for our budget needs into the hands of private and religious schools instead, with zero accountability to the public. [See “EITC No Credit to PA”; Keystone Research Center, “No Accountability,” 4-7-11]. Yet Dr. Fuller’s Black Alliance for Education Options (BAEO) actually boasts about its role in creating those programs here in our state. Even more shocking, the BAEO claims it was “instrumental in passing the law that led to the state takeover of the School District of Philadelphia, which has led to an increase in quality educational options for poor families.” That’s right — the BAEO is proud of the state takeover of Philly, which has mercilessly defunded that school system and created horrific conditions there. It’s even worse than that Halloween when you thought you would get a full sized Hershey’s bar from the house down the street and wound up getting a toothbrush, instead. Tomorrow’s A+ event is being co-sponsored by PennCAN, which will be giving away copies of Dr. Fuller’s new book, No Struggle No Progress: A Warrior’s Life from Black Power to Education Reform, to the first 100 people in the door (costumes are apparently not required). PennCAN is an off-shoot of the Connecticut based ConnCAN, founded by hedge fund managers with a long history of funding charter schools and charter management organizations (CMOs). These are not educators, they are financiers who know about making money for their portfolios, and view schools as investment opportunities. [See “Can or Con?”] Here in Pennsylvania, PennCAN promotes charter expansion, a statewide authorizer of charter schools (that would remove control and accountability from democratically elected local school boards), vouchers, funding for early childhood (something we agree on), the elimination of teachers’ seniority, and teacher evaluation based on high-stakes student testing. Are these the answers we are looking for to help all of our children? Why aren’t they talking about things like smaller class sizes, libraries for all students, the restoration of art and music, tutoring programs, and wrap-around services? Charter expansion, vouchers, and tax credit programs don’t get us great public schools for all our kids. So you decide: is school choice a trick, or a treat? The first astroturf group popped up here like a weed last month just as the weather started to warm. 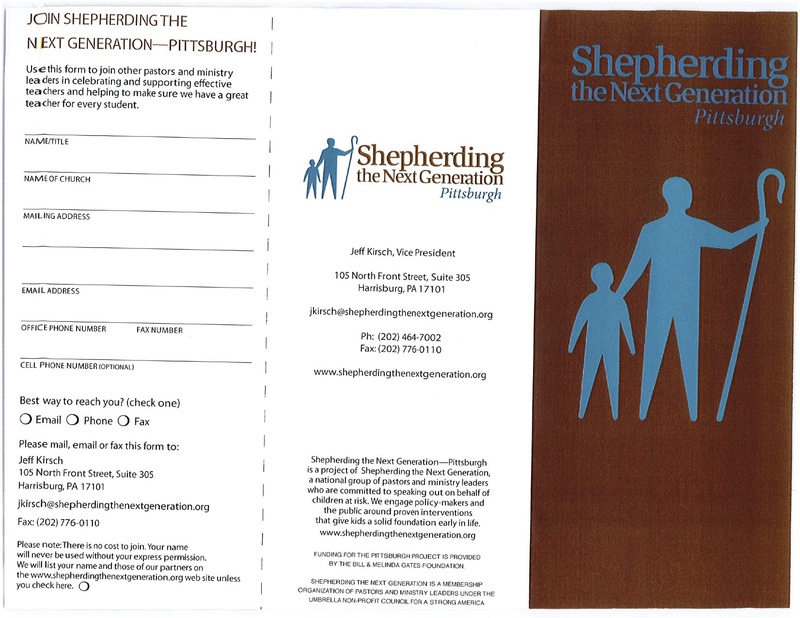 Called “Shepherding the Next Generation,” this Washington D.C. based group received money from the Gates Foundation to start working in Pittsburgh. 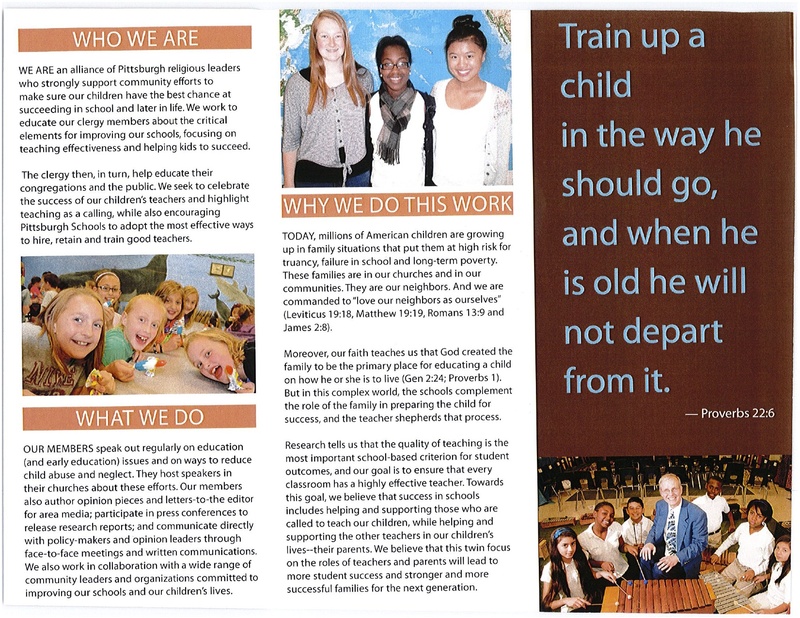 They’re not hiding that fact – it’s right there in small print at the bottom of the flyer they are passing out to local churches in an effort to recruit them (though it’s not on their web site). They call themselves an “alliance of Pittsburgh religious leaders who strongly support community efforts to make sure our children have the best chance at succeeding in school and later in life.” So far, sounds good, right? Well, first of all, there is no alliance. The group just hired an organizer who has been approaching churches – especially those in our African American communities – to try to encourage them to join. Want a real alliance of religious leaders who have been actively working on public education for the past three years? Try PIIN, the Pennsylvania Interfaith Impact Network, with over 50 area congregational members (Christian, Jewish, Muslim, Unitarian, and everything in between). As we know, the Gates Foundation has been pouring its money into teacher evaluation programs around the country, including $40 million to the Pittsburgh Public School district for teacher evaluation. [See “The VAM Sham”] The problem with this is twofold. First, it focuses on the wrong thing. Gates and the corporate-style reformers who promote teacher evaluation will always say that teachers are the most important “in school” factor affecting learning — but really, this comes out to about 15-20% at most of measurable factors. By far the biggest influence on student learning is out-of-school factors. And this is where poverty is the real story. So while Gates and others are pumping money into teacher evaluation and trying get “better” teachers, they refuse to acknowledge (or at least downplay) the very real role of poverty and its impact on our kids and learning. A favorite line of the corporate-reformers is that “poverty is no excuse” for student performance. But this is a huge equity issue. What if those organizations put all that money into real poverty programs? It pains me to think about our clergy here in Pittsburgh being urged to talk about fixing education by making teachers better, while ignoring poverty — the issue that should be near and dear to the hearts of all our faith leaders. Second, even among in-school factors, we have to ask why the corporate-reformers are so focused on teachers. This starts with the assumption that we have a plague of bad teaching. And this is just not what I am seeing. Of course we want good teachers in front of every child. And of course we need to make sure that poor teachers are shown the door. (Though remember the definition of “bad” is a moving target – a “bad” teacher this year might have been great last year, and may be good next year – and much of what we really value in teaching, such as inspiring kids, cannot be measured on a high-stakes-test.) What I am seeing are teachers struggling with massive budget cuts, years of inequitable resource distribution, a drastic narrowing of the curriculum due to high-stakes-testing, and teachers battling a tidal wave of de-professionalization and vilification. What if Shepherding the Next Generation put its time and resources into fighting for adequate, equitable, and sustainable state funding for our schools? Or lobbied Harrisburg for charter reform that would save our districts millions of desperately needed dollars? What if it helped us have a conversation about the impact of mass school closure on communities of color? What if it worked to help us build local schools into community centers, filled with vibrant resources for the entire neighborhood? Or helped us find creative business partners to fill unused school space? Even those who are still fans of Gates and his agenda ought to be wary of this astroturf phenomenon. Having one of the wealthiest people on the planet funding outside organizations like this to come into a community and shift the public conversation seriously erodes democracy. Now how about this group: the “Center for Public Justice” is another Washington D.C. based organization that just waltzed into town. In a Facebook invite that went up last week, the Center says it “has embarked on a new pilot program in the city of Pittsburgh called Christians Investing in Public Education.” What that investment will be is not clear. What is clear, however, is the Center’s evangelical religious mission. The group calls homosexuality “abnormal and immoral” and an “unhealthy form of human relationship.” [CPJ website] They oppose gay marriage and don’t believe in reproductive rights. They do believe in our public taxpayer dollars being used to fund private religious schools, despite the fact that it’s against our state constitution. (See discussion of the Blaine Amendment, under “There’s Nothing Smart About ALEC”.) The Center believes that “public funding should be offered without regard to the religious, philosophical, or pedagogical differences among the variety of certified schools parents choose.” To this end, the group explicitly promotes vouchers and religious charter schools. The Center also wants to de-regulate what is taught in school. They argue, “Schools receiving public support, whether via vouchers or directly, should be free to hire staff and to design curricula that reflect their distinctive educational, philosophical, and religious missions.” What this really means, of course, is that teachers ought to be able to teach creationism in science class. Never mind that the U.S. Supreme Court has ruled repeatedly that this violates the establishment clause of the U.S. constitution (the separation of church and state). There is even a 2005 federal decision that came out of a Pennsylvania court case ruling that “intelligent design” and creationism are the same thing and may not be taught in public schools. This is a hot topic right now, as a Post-Gazette report this past weekend revealed. Almost 20% of science teachers believe in creationism. And a Penn State survey found that despite the law, between 17-21% of teachers bring the concept into their classrooms. [Post-Gazette, 4-28-13] Have you seen the 4th grade “science” quiz making the rounds on Facebook this past month? It shows the astonishing way in which “young earth” creationists (who take the Bible literally and believe the Earth is only 10,000 years old despite overwhelming scientific evidence to the contrary) are teaching school children that people and dinosaurs lived together on the planet. Unfortunately, this Center for Public Justice group planned to host three sessions this week – using Pittsburgh Public School space – to meet with parents, teachers, and school administrators. The Education Law Center verified that the school district has a facility use policy allowing all groups to request space. This is obviously a good thing as far as free speech is concerned. But it also means that our own public schools might be forced to host bigoted groups like this one bent on privatizing them right out of existence. So we have to stay vigilant about organizations that pop into town and ask lots of questions. Fortunately, after we started doing just that last week, the Center announced that it is “postponing” its sessions. Who knows if their decision is related or if they will be back? But we better be on the lookout, because these groups with clear privatization agendas and astroturf organizations have found the road to Pittsburgh. They might be surprised to learn that Yinzer Nation is no fan of the fake stuff – even Heinz Field has real green grass for our beloved Steelers. And PNC Park sports the real stuff for our Pirates, too. Astroturf us? Git’aht! At #8 and #10 on the list are Joel Greenberg and Arthur Dantchik. Public Source, which put together the report, notes that these two “act as one when making political contributions,” and that if we “consider them as a contributing team, you must include Jeff Yass,” who would be #11 on this list. Greenberg, Dantchik, and Yass went to college together and are founding partners of Susquehanna International Group, a financial broker-dealer in Philadelphia. For those of you keeping track, that makes four of Pennsylvania’s biggest campaign donors so far this year with school privatization at the top of their to-do lists. Why? Lest you think these men are dabbling in education for the sake of students, take a closer look at the Big Business of charter schools. Back in August, CNBC interviewed the CEO of a major investment company who clearly explained why charter schools are such a great moneymaker. David Brain heads Entertainment Properties Trust, which owns movie theaters, destination recreation sites, and charter schools in 34 states. Indeed. This is not about doing what is best for students. Charter schools have become investment opportunities for the wealthy and their portfolio managers, businesses that must be protected with favorable legislation bought by strategic campaign contributions. As these charter school operators feed at the public trough, they strip our public schools of desperately needed resources. It’s time to fight back. Public education is a public good, not a cash cow.